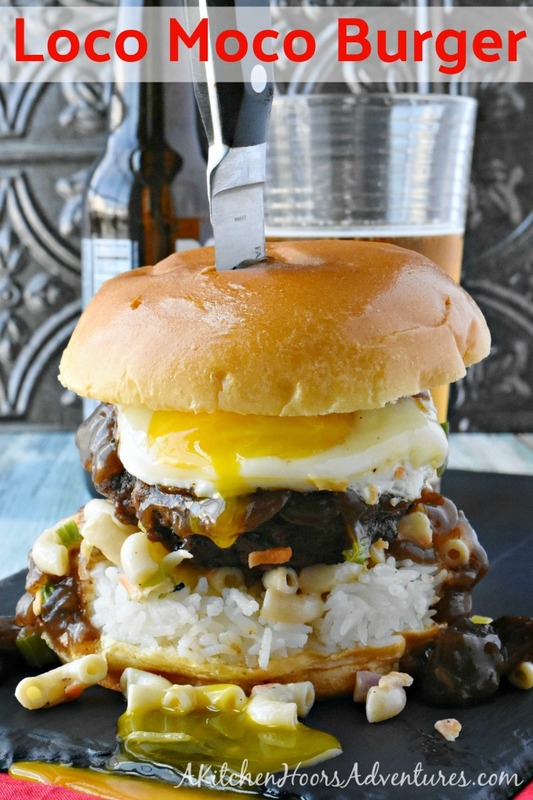 This Authentic Loco Moco Hawaiian Burger sits on top of a rice patty and traditional Hawaiian macaroni salad and is topped with the rich beef gravy and a sunny side up egg. It has all the flavors of an authentic loco moco Hawaiian breakfast. It’s the ultimate in breakfast burgers. This post is part of a killer burger grill giveaway hosted by Girl Carnivore but the burger recipe is my own along with all other thoughts and opinions. We finally went to Maui to visit Mom. She’s only lived out there for like what 5 years now? I KNOW! I get that look every time I say how long she’s lived there and that, no, we haven’t gone out there to visit her. And then, I get that OTHER look when I tell them they will fly us out there to visit them. Thanks to my job it was not so easy for me to take long periods of time off and to go to Maui and make it a decent trip, I needed to take a long period of time off. Fast forward a few years and one HUGE and horrible transition to a new software system and miraculously I finally have the ability to take a large amount of time off. Oh, and the hubs has the flexibility in his schedule to take time off, too. So, I gave them a date and we hopped on a plane. First, we flew to Seattle to spend the day and night with his half-sister, niece, and nephew. I had only met his half-sister once for a funeral and had only face timed the kids when we were with his dad and step-mom. So, it was fun to get to meet them in person and spend time with them. The next day, we hopped on another plane and headed to Maui! I was excited, but tired. By this time, my body didn’t know what time it was, which was probably a good thing. Because when we landed in Maui it was like 3am my time? I think? It was probably a good thing it was late because I was so tired I could easily sleep a decent amount of time. We spent a packed week with Mom. Being the foodie that I am, they took us to great places with great food! And not the typical touristy places. Though we did hit one or two of those. Morimoto being one of them. Being a non-sushi eater that was interesting! I did try California rolls, but it’s the nori that kills me. SO, I deconstructed mine and nibble on the insides. Mom shared half her chicken bahn mi and I had a slice the DSD’s pizza. That’s dear step-dad to those that don’t know. Of course, the hubs was in hog heaven! He had a sashimi plate and devoured the whole bloody thing. I think I shared it on my personal Facebook account. If you’re a friend, then you probably saw it. His plate was bigger than his head! We saw HUGE waves and turtles. We snorkeled with the fishes and saw whales. In the pouring rain we watched a baby whale learn how to breach. This was after baby sitting an entangled teenager whale caught in over 400 feet of netting or rope. Pacific Whale Foundation does just that; help the whales! And other sea creatures, too. We went to a plantation and an organic vodka distillery. Yes. Organic vodka and it is AMAZINGLY smooth. Oh yeah, they make rum, too. I can’t wait to see THAT in my local ABC stores. It’s better than vodka and rum I’ve ever tasted. Being a foodie, I had just a few requests. I wanted to taste the vodka, see Haleakala, and have some loco moco. Wait, what? You don’t know what loco moco is?? It’s a dish invented about 1949 by some teenagers looking for something easy, frugal, and delicious to throw together that wasn’t a sandwich. It’s traditionally rice topped with a burger and brown gravy. Of course, the egg came later. Hawaiian macaroni salad must accompany with every loco moco. The hubs has deemed it the best macaroni salad he’s eaten. So, I guess I’ll be keeping this macaroni salad recipe handy to make this summer. When I signed on to participate in #BurgerMonth with Girl Carnivore, I knew one of the two burgers I had to make. The other one will be coming later in the month. But this one was a no brainer for me. I mean, I had authentic loco moco. It’s a burger. How could I not turn this into an actual kicked up, ultimate burger that you can’t wait to dive into? But, I had to do some research. I wanted to make sure that macaroni salad was correct. And I had to make sure the ingredients in the gravy were correct, too. It’s not just a simple brown beef gravy. The version I had included mushrooms so they had to go in my recipe. The last element I wasn’t sure about was the rice. 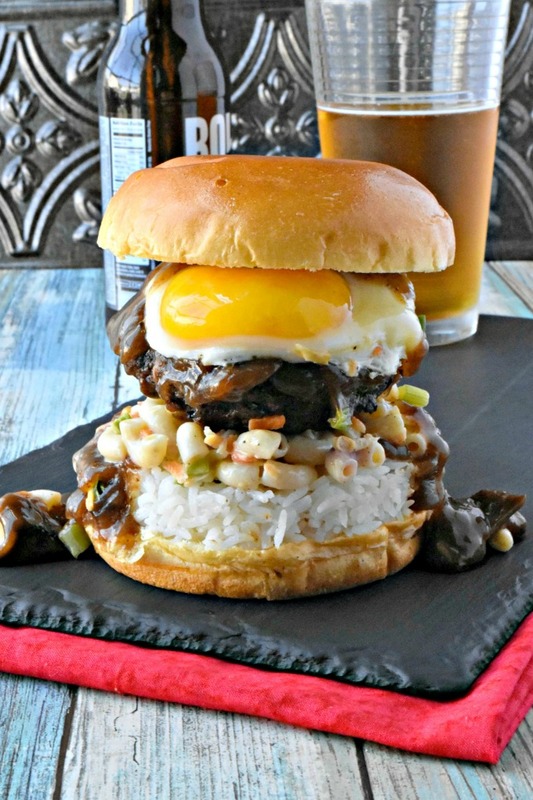 But seeing The Spiffy Cookie’s Sushi Burger, I was inspired to form a rice patty for my burger. Because you have to have the rice for loco moco! But, I wasn’t adventurous enough to make a rice bun. Maybe next year! Of course I’m going to participate next year! Wouldn’t you?? Yes, the egg went EVERYWHERE! I made such a mess with that egg drool. It just kept pouring out of the egg and who was I to make it stop just for cleanliness sake! Everything is washable in my kitchen. It has to be. And that red, to be honest, is just a scrap from Walmart. Love those fat quarter scraps of fabric. So, is your mouth big enough to dive in? HAH! Mine’s not. I devoured it with a fork and knife and it was amazing. 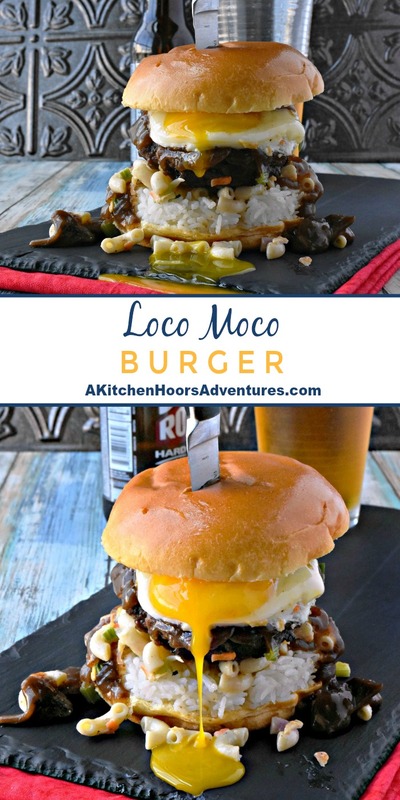 All the flavors are there for loco moco. And while there’s a huge list of ingredients and steps, they’re all pretty simple. You can easily make the mac salad beforehand. I even made the broth part of the gravy before hand and then just heated and thickened the day we had the burgers. The rice you can definitely make before hand and it might help you make the patties. And, well, it is an epic burger! It’s most definitely worth it! Make sure you enter the giveaway. That’s worth it, too! Cook the pasta according to package directions omitting additional salt. Drain the pasta and toss with the apple cider vinegar. Cool to room temperature. Combine the mayonnaise with the milk, grated onion, and sugar and stir until the sugar dissolves. Toss the dressing with the pasta, green onions, carrots, and celery. Refrigerate overnight. Heat a small saucepan over medium-high heat. Coat with cooking spray (or oil) and saute the onions until they begin turn translucent. Add the mushrooms and cook until they release their juices. Stir in 1 cup beef broth and Worcestershire sauce and allow to simmer on low heat until the burgers are cooked. Preheat your grill to high heat. Divide the ground beef into 4 patties. Cook the burgers 3 minutes then rotate them 45 degrees and cook an additional 3 minutes. Turn the burgers over and repeat. Tent with foil to keep warm. When you have flipped the burgers over combine the remaining beef broth with the cornstarch. Whisk into the mushroom and broth mixture and simmer until thickened. Keep warm, stirring occasionally. Place a nonstick skillet over medium heat. Spray with cooking spray (or coat with oil or butter) and crack the eggs into the pan. Cook the eggs until the whites are cooked through and the yolk is cooked to your liking (for me that’s well done, but the hubs loves his runny). Using a biscuit cutter or ring to a large mouth jar, press the rice into a circle. Place the rice on the bun. Top with macaroni salad and a hamburger patty. Drizzle the gravy over the hamburger and top with a sunny side up egg and the bun top. Serve with any remaining macaroni salad and a Maui Brewing Coconut Hiwa Porter. Chances to win these great prizes! A huge thank you and shout out to the #BurgerMonth sponsors, American Lamb Board, Anolon, Cabot Cheese, Crow Canyon Home, Melissa’s Produce, Microplane, New York Beef Council, Red Duck, Spiceologist, Veal Made Easy, and Weber Grills. They provided some product samples and the giveaway prizes, but all opinions are my own. YESSSS I’m so excited you added a rice patty! Thank you for the inspiration!! It was so easy to make and add. Definitely making a bun next time.